This sectional sofa was designed to bring out the best in style and value. Crafted for use in living rooms and family rooms, this sectional features a corner construction, making it ideal for use against walls in smaller rooms or for use in large rooms where the corner shape can create room separation. The frame is built so that the chaise can be used on either the left or right side, increasing the versatility of the overall sectional. It is covered with a combination of microfiber and leather-like vinyl upholstery and features baseball stitching for a tailored accent. The seats have decorative tufts that keep the style current and wood feet and track arms help to enhance the contemporary look. This piece is complete with included accent pillows. The Mallory collection was designed to create an inviting and warm atmosphere in homes. Ideal for use in living rooms or family rooms, this collection features a reversible sectional that can be rearranged to suit the needs of your room. The construction includes pocket coil seating for individualized comfort while loose seat and back cushions allow for easy fluffing. Each piece is wrapped in microfiber and leather-like vinyl for a fresh urban look without the high price point that comes along with leather. Details of this collection include exposed wood legs, smooth track arms and baseball seam stitching. 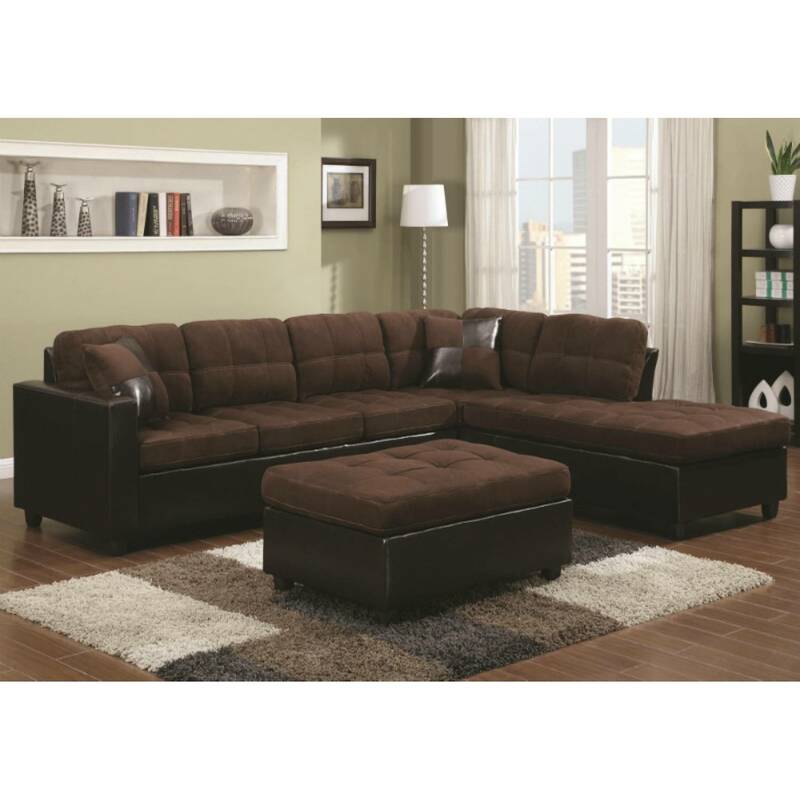 Item Description This sectional sofa was designed to bring out the best in style and value. Craft.. Item Description This sectional sofa was designed to bring out the best in style and va.. Item Description Fulfill your fantasies of luxury and glamor with this full Regina upho..